I only remembered that I had Pentax 67 300mm F4 lens when I was going through my archive looking for a portrait requested by a book publisher. I used it for just two months — and it was enough to decide whether I want to keep it or not. I bought it for a relatively small price because of its malfunctioning aperture unit – it was shutting as required but returning to its initial position after a certain lag. This defect, in fact, did not hinder the shooting as I only had to wait for a few seconds before being able to do another shot. It later transpired that this defect happens occasionally on these lenses. There is a clip on YouTube about how to fix this aperture problem. Unfortunately, I was unable to follow this advice myself as this video was posted long after I sold the lens. 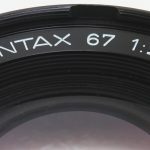 Generally speaking, the Pentax 67 300mm F4 lens is not as heavy and huge as it is said on various forums. For instance, it quite fits in the upper part of my Lowepro Fastpack 200 backpack together with the camera but with its pentaprism removed. The lens weighs about 1.4kg, which is 600g more than a 165mm F2.8 “portrait” lens and 500g more than an old Takumar 6X7 200mm F4 (I). Noteworthy, its replacement – M* 300mm f/4 ED [IF] – is 200g heavier while the next lens in a Pentax 67 lens series – old Takumar 6X7 400mm F4 – is heavier by 1.1kg! Thus, Pentax 67 300mm F4 lens is, probably, the latest among Pentax 67 lenses which allows to make handheld shots relatively easy. It will definitely require faster shutter speed, with 1/500 being the most preferable choice, which is most compatible with 400 ISO film. It is also possible to do it using 1/250 with mirror lockup, but it requires certain practice. However, it is not really convenient to compose vertical images with this lens. Unfortunately, I do not have illustrations to compare it with other lenses, but it is worth noting that 300mm F4 is almost 9cm (1.9x) longer than a popular “portrait” lens 165mm F2.8 and almost 5cm longer than late 200mm F4 (II), which is not that much as you may expect after seeing separate images of these lenses. I don’t do lens tests with patterns but only describe my impression from the equipment I use. Due to the fact that I had to use fast shutter speed during handheld shots and at the same time 100 ISO film, it is obvious that I shoot with a wide open aperture. I generally liked its sharpness in these conditions. There is much talk about this lens having chromatic aberration. I have not analyzed this condition specifically as I primarily shoot on black-and-white film and it is not really that important for me. But it is worth keeping in mind that this lens was later replaced with its apochromatic version M* 300mm f/4 ED [IF] — and it, probably, did not happen for no reason. This lens has a minimum focus distance of 5m, which is equal to a maximum magnification ratio of 0.07×. It means that this lens is not capable of close focusing and, frankly speaking, it was not designed for this. But if such a need arises, due to it being a long-focus lens one has to use the entire set of extension rings #1+2+3 with maximum magnification ratio about 0.4× or get a look at its later version — M* 300mm F4 ED [IF], which has a maximum magnification ratio of 0.23x, which even exceeds a 90mm F2.8 standard lens. This allows it to be used for close-ups without any of extension rings installed. My lens had a 9-blade aperture. But there are lenses with a 7-blade aperture. If you plan to buy this lens, I suggest you pay attention to this as the 9-blade aperture has a more circular opening which leads to a smoother bokeh if the aperture is set at F11-F45. However, it seems that the 9-blade aperture is more likely to get stuck as I came across at least two lenses with the same defect. Also, if you take a closer look at the photos of the two types of apertures, you will notice that their design has more differences than just the number of blades. The lens has a 82mm filter thread which works fine with both screw-in and special bayonet mount filters. Filters of this size — both screw-in and bayonet — are not very common for Pentax 67 lenses. Apart from Pentax 67 300mm F4 they also exist for 75mm F4.5, 75mm F4.5 Shift and 45mm F4 lenses. The lens has a built-in sliding hood. As distinct from a similar built-in sliding hood of a 165mm F2.8 lens, it is set deeper and should better protect from the sidelight. So, I sometimes used Mamiya G2 bellows hood with the 165mm lens. This lens is made according to a relatively modern optical formula typically used for telephoto lenses. In general, nothing special can be said about its bokeh effect, as opposed to those of 105mm F2.4 and 150mm F2.8, or even 165mm F2.8 lenses. However, it cannot be described as unpleasant either as it nicely blurs the background, largely due to the lens’s large focal length. All images in this post are shot with a wide-open aperture and on Chinese Lucky SHD 100 film, developed in Kodak D-76 1+3. In general, I liked this lens as it is relatively small and fast for a 300mm, compared to 200mm and even 165mm lenses. Under certain conditions it is quite possible to use it without a tripod; I even managed to use it for street photography. And one of the most important impressions from its use is that for the first time, I felt myself secure while shooting outdoors. I did not have the feeling that I attract everyone’s attention as with this lens it was possible for me to stay at a considerable distance from photo subjects. Lovely work and thank you for all this information. Quite helpful.